The premiere of Christopher Nolan’s third — and likely final — Batman movie is edging closer and closer, so it’s no surprise that we’re starting to see the first wave of tie-in products for The Dark Knight Rises. 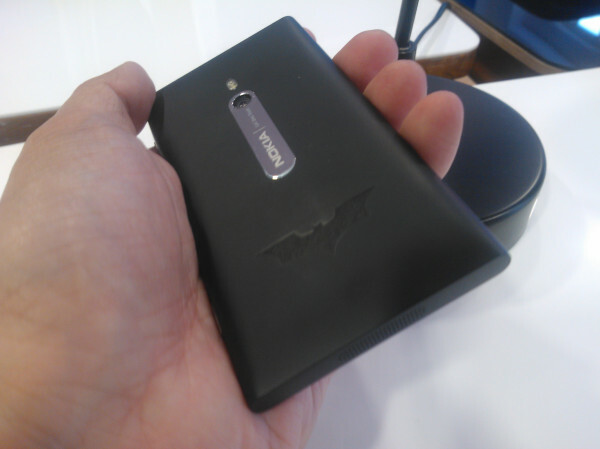 Just before the UK premiere of The Dark Knight Rises prologue, Jon Choo managed to get a peek at one of the Lumia 800 smartphones featuring Batman branding that Nokia created as tie-ins for the film. With only 40 of the handsets made, there’s little chance you’ll ever see one of them in stores — though a few might end up on eBay. As you can see in the brief unboxing video Choo created, the Windows smartphones are packaged in a matte black sleeve with the Batman logo, and they each have the Batman symbol laser-etched on the back of the handset. They also appear to come with at least one pre-installed The Dark Knight Rises app, and a background image featuring the chief villain in the film, Bane.